extra legs give the cows a distinct advantage", said one IOC official. with the "green" mandate of these games. 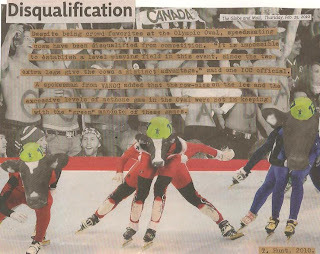 Collage #61 of my Globe and Mail Project: deconstructing Canada's National Newspaper and putting it back together to try and make sense of the world. All images used in this collage were clipped from today's Globe. OMG they have to get with the program these IOC guys. Genetic programming means MORE speed skating cows not less. Get with the 20-10's already... the new millenium is ov-ah! Globe and Mail Project: #54 WORST OLYMPICS EVER?